This time we started from Bagh Sardaran and got there on the rickshaw. It’s hardly fifteen minutes from Rawalpindi Saddar. We saw two well preserved Hindu temples right on the main road. It’s difficult to go in as the commercial properties around the temples do not encourage pesky tourists like us. They probably think we are crazy in the head to be wasting the weekend checking out worn out temples. Sujjan Singh Haveli is also on this road and is covered here. 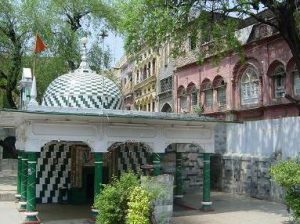 After Bagh Sardaran, traveling south on foot, we reached the main Jamia Masjid right at the junction of Bagh Sardaran and Jamia Masjid road. This mosque is 100 years old and is a stark contrast to the bland commercial area all around it. It is brightly colored with intricate frescoes on the walls and roof. I haven’t seen anything like this anywhere in Rawalpindi. Only the glass work on the entrance is native to this region. The mosque has a huge courtyard, rooms for khateeb and a basement below the main structure. 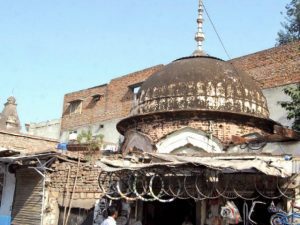 This mosque was built in the center of an area dominated by non-Muslim traders and temples. 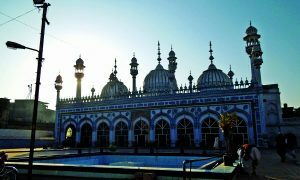 It is said construction cost was borne by an exiled prince of Afghanistan, local Kashmiri traders (Mian) and traders from Peshawar. After the mosque, we crossed over to the other side of the road and into the narrow lanes that lead too Purana Qila road. Purana Qila road rises steeply on top of which is another Hindu temple. The Qila is long gone. The other temples in the area are explained here. Taking another narrow lane, we headed toward Shah Chan Chiragh Ziarat. Shah Chan Chiragh was the cousin of Bari Imam and originated in Chakwal. This order arrived to this region from Iran. Chan Chiragh is said to seek spiritual purity from the flaming tree trunk still visible in the courtyard. The imam Bargah is beautifully decorated with glass work. Outside this Ziarat has everything from the ‘behishti Darwaza’ to the holy white horse to the sacred oil. Lots of people still visit the place. We exited the narrow lanes towards Laal Haveli, the bordello of yesteryears. Buddhamai was the lady who ran the establishment after her chief patron, a Hindu named Saigol Sahib, left it for her in 1947. The lady and her brother were murdered mysteriously and was eventually purchased by the book merchant Sheikh Rasheed, who dreamed of acquiring it one day. It had a temple and a mosque inside its walls. Another temple adjacent to the haveli is about to fall down, owing to its deterioration. From here we walk right up to Savour Foods and had our fill of chicken pulao. The complete walk was not more than an hour.